The New York Giants traded away Odell Beckham Jr. and instantly opened up another huge hole on their roster. The Giants tried to patch that hole by signing slot receiver Golden Tate, however, Tate is 30 years old. The Giants do not have a ton of young talent at the receiver position, outside of Sterling Shepard. When the Giants acquired the 17th pick in the 2019 NFL Draft in exchange for Odell, fans instantly began to speculate on whether or not that pick would be used to draft Odell’s replacement. Speculation grew on April 3rd as the Giants decided to bring a wide receiver prospect in for a visit. On April 3rd, Ole Miss wide receiver prospect A.J. Brown visited with the Giants. Brown has interest from other NFC East teams, too. Brown visited the Eagles last month and will be visiting the Redskins this month. Outside of the NFC East, Brown has received interest from a few wide receiver-needy teams. Last month, A.J. Brown visited with the Packers and Bills. If the Giants want A.J. Brown, they are going to have to be aggressive and get him before any of these other teams have a chance. A.J. Brown has been an underrated and underhyped prospect so far throughout this offseason draft process. His teammate at Ole Miss, D.K. Metcalf, has received all of the hype for wide receiver prospects. Metcalf is a flashy prospect, and Brown is not. However, that should not take away from the fact that Brown is arguably the best receiver in this draft class. Sure, Brown might not be the huge, physical specimen that Metcalf is. And he may not be near as athletic. But Brown excels in plenty of other areas. Plus, his athletic ability is more than enough to get the job done. At the 2019 NFL Combine, A.J. Brown tested comparably to plenty of starting NFL wide receivers. The average speed for an NFL wide receiver is 4.48, and A.J. Brown posted a 4.49 40 yard dash time. NFL receivers who ran similar times include A.J. Green (4.48), Alshon Jeffery (4.48), Antonio Brown (4.47), and Hakeem Nicks (4.51). A.J Brown also posted solid measurements in other athletic tests. He did 19 bench press reps as well as 36.5-inch vertical jump and a 120-inch broad jump. Brown flashed a lot of this athletic ability during his time at Ole Miss. It was most visible while Brown was running routes and making plays after the catch. He had elite agility, allowing him to create separation on routes and make defenders miss in open space. In his junior year at Ole Miss, A.J. Brown was incredible. He hauled in 85 receptions for 1,320 yards and 6 touchdowns. 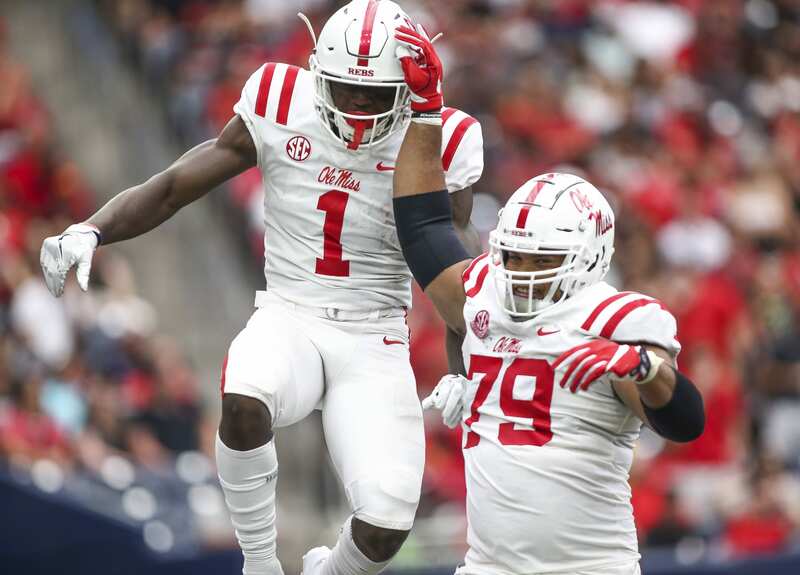 Brown was the primary receiver on the Rebels because he was a much more reliable receiver than Metcalf. Brown is a consistent route runner with solid hands. He will be a great player wherever he goes, and the Giants would be lucky to have him. A.J. BrownD.K. MetcalfGiantsGolden TateNew York GiantsNYGOdell Beckham Jr.
Could the New York Giants Draft a Wide Receiver at No. 17?